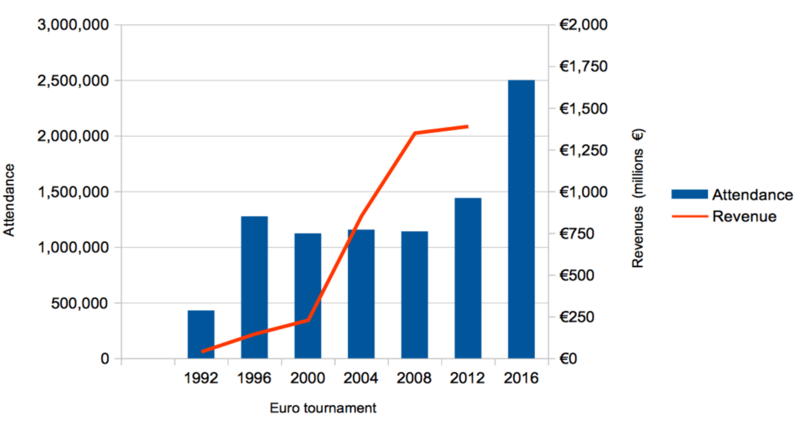 The more cynical argue that inflating the scope and scale of the tournament is driven more by financial motives than sporting or political ones. The steady rise from the four teams that contested the inaugural finals of 1960 through the years of eight and 16 teams to the new set-up means more games and therefore more commercial activity. Adding eight extra teams means an additional 20 matches, not to mention eight extra sets of fans, television territories and commercial domains with a direct stake in who wins. The 2.5m people UEFA expects inside the ten host stadiums, 1.5m of whom will be visitors to France, is a predicted rise of more than 1m on the 2012 tournament in Poland and Ukraine (see graphic). No doubt this will see the tournament better the €1.4bn (£1.1bn) in revenues generated last time around. The total prize money for the tournament is to be €301m, a big rise on the €194m in Euro 2012. The overall winners will earn their national association a maximum of €27m, while all participating nations earn a minimum of €8m. Yet these payments are dwarfed by the prize money in Europe’s top domestic leagues. Aston Villa came last in this year’s English Premier League but pocketed more than €80m in prize money. This year’s fairy-tale winners, Leicester City, won in excess of €100m. The Premier League is a bigger beast, of course. It generates TV rights of €2.2 billion a year whereas the rights associated with the Euro finals are estimated at around €1 billion – though the Euro finals are worth much more per game: about €20m vs the Premier League’s €6m. To put the Premier League into context, UEFA has said that when the new TV rights deal raises the pot to around €3.3 billion a year from the 2016/17 season, it will probably outstrip the media rights associated with the National Football League (NFL), the home of American football in the US. This is expected to help the combined financial earnings of European football overtake America’s big four: American football, basketball, ice hockey and baseball. As for other major football tournaments, the UEFA Champions League produced revenues from rights and sponsorship of €1.5 billion in 2014/15. Brazil’s World Cup of 2014 was even more lucrative, producing revenues of €3.5 billion from rights and sponsorship (plus another €465m from ticket sales). Also crammed into this summer of sport will be the Olympics in Rio. The Olympics might be expected to appeal to a wider audience both in terms of sporting preferences and geography. As such Rio represents a different league of financial opportunity. Separate figures for the income of the London Olympics in 2012 are not available, but the combined income for that event and the Vancouver Winter Olympics of 2010 was €13.2 billion. While comparing a European event for one sport and a world event for many sports is only fair up to a point, there is a marked difference in the infrastructure investments that they require of host nations. France has renovated stadia that will likely be heavily used by teams for years to come. Brazil by contrast is looking carefully at each and every item in an attempt to control costs. The Olympic investment budget is several times bigger than Euro 2016, coming in at around €9 billion. The Brazilian economy was booming in 2009 when it won the right to host the Rio Olympics and politicians there would be forgiven for wondering whether “won” is the right descriptor – particularly after the World Cup. As well as the huge infrastructure project, there will be anxieties over the threat of terrorist attacks and also the challenge of dealing with the Zika virus and its adverse publicity. Euro 2016 has its own security challenges, coming so soon after three major terrorist attacks in France and Belgium. And UEFA is currently without a leader after Michel Platini resigned last month over an inappropriate payment from former FIFA head Sepp Blatter. Yet there is no sense that hosting this event is a poisoned chalice in the way that the Olympics is sometimes seen. Football has become a global sporting juggernaut in recent years. 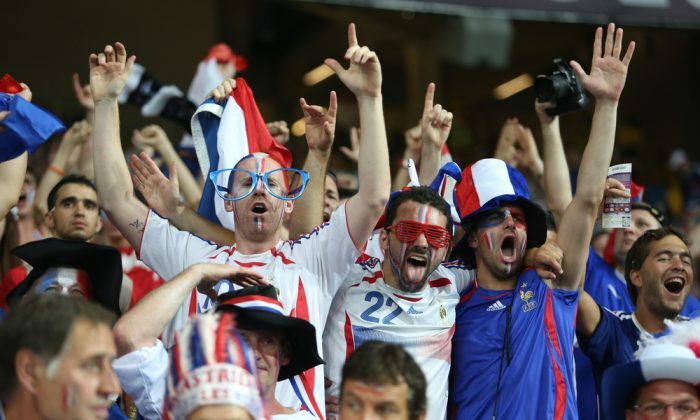 Euro 2016 may not be the largest tournament in financial terms, but it just got a lot bigger. It benefits from the global popularity of both individual players and the club teams they normally represent. Whether the action on the pitch lives up to the hype, of course, we won’t know until we tune in. Robert MacIntosh, Head of School of Management and Languages, Heriot-Watt University. This article was originally published on The Conversation. Read the original article.